Patti Penn, with her husband Rick, tells a gathering outside the McLean County Law and Justice Center about her stepson's overdose death and the family's efforts to start a conversation about drug abuse so others can get help. That's one plant for each overdose in the county last year. The plants were provided by Penn Landscaping and Sunburst Nursery of Bloomington. Its owners, Rick and Patti Penn, have their own tragic story. Patti Penn described losing her stepson Ryan to an overdose 11 years ago. She said Ryan battled a heroin addiction for 12 years before he died at age 25. Penn said the pain never goes away. “We have never gotten over it,” Penn told a gathering at a news conference outside the Law and Justice Center. “We have only gotten through it together." Penn added it’s time for families to remove the stigma about drug abuse and begin a community conversation so people will see it as an illness like cancer and heart disease. “Addiction is a community disease,” Penn said. “One person (will) use but our whole community will suffer in so many different ways. County Health Department Director Camille Rodriguez said she hopes more people sharing their stories will encourage others to seek help before it’s too late. “It’s the data that drives a lot of our actions, but it’s the family stories that are going to bring the reality of this problem to the forefront,” Rodriguez said. 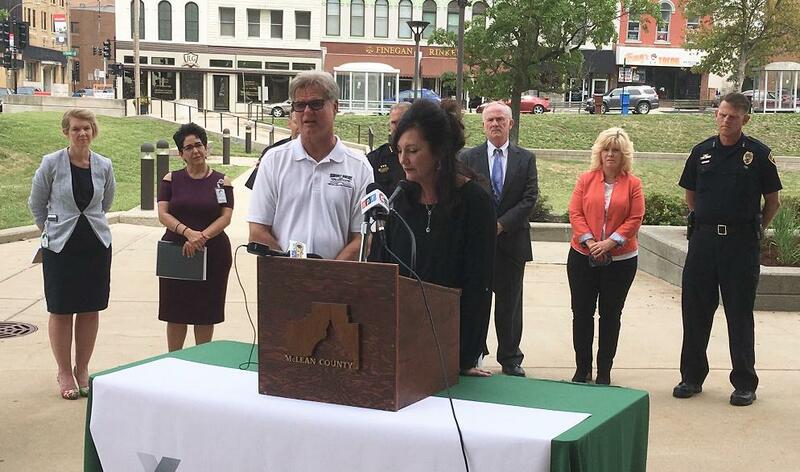 Rodriguez credited the McLean County Sheriff’s Office’s new Safe Passage program with taking a proactive step in providing an avenue for those battling a drug addiction to get counseling and treatment. There have been 17 overdose deaths in the county so far this year. An except from GLT's interview with McLean County Behavioral Health Coordinating Council Supervisor Trisha Malott and McLean County Sheriff Jon Sandage about opioid abuse awareness.